Appellation or Vine Malvasia delle Lipari D.O.C. 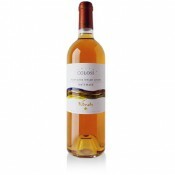 Malvasia delle Lipari is a naturally sweet D.O.C. wine that was proclaimed "Nectar of the Gods" by King Diodoro Siculo in the fourteenth century. It is produced from the Malvasia grape and a little Corinto Nero, both of which come from the island of Salina in the Eolie archipelago. The process of drying the grapes in the sun gives Malvasia delle Lipari a highly individual taste and aroma of the land where it has its origins. A combination of modern technology and the countless traditions of the Eolie archipelago, result in a certain fragrance and unity to the warm and velvety taste of Malvasia delle Lipari, which makes it one of the most excellent dessert wines on the market. Malvasia delle Lipari Passito has a golden yellow colour and a fragrant aroma with a rich perfume of honey, eucalyptus and apricots. It has a warm, fragrant taste. 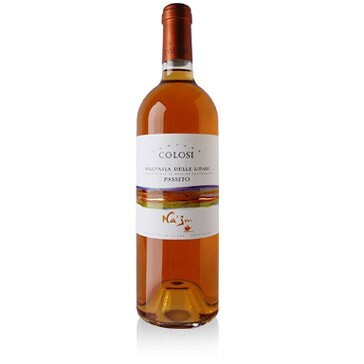 Colosi is a company, which operates in the wine sector for over three generations. The cellar is run by the oenologist Piero Colosi, who due to his father Pietro's precious contribution follows all the various passages; from the vinification to the withering and from the bottling to the marketing of the wine. 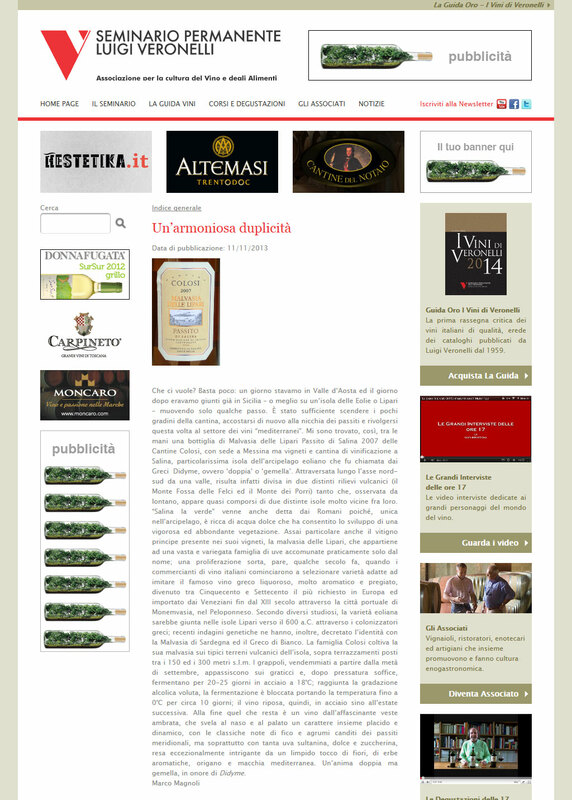 The company has also been handling the production of an antique wine called Malvasia delle Lipari. The company comprises a surface of ten hectares in Salina (a small island which is part of the Eolian archipelago). They are situated in Gramignazzi in the outskirts of Malfa. This area is recognized as being one of the best on the island both for its exposure and for the natural chemical aspect of the ground, which is particularly adequate for the cultivation of vineyards due to the fact that it is of volcanic origin. The equipment for the vineyards is made difficult due to the morphology of the territory and therefore small terraces have been made and the old dry walls are utilized. Guyot type pruning is carried out and leaving only a few buds, since the impossibility of irrigation highly effects the plant in the hottest months. The Malvasia grape is harvested in mid-September of the first half of October since the grape must reach the highest level of maturity in order to obtain a 28% to 30% sugar level. The fine, long-lasting quality of it aromatic components, and the generous residue of sugar, makes this wine an ideal accompaniment for fresh or dry desserts, ice-cream and fruit. The wine should be served at 15 - 18 degrees centigrade in clear, transparent crystal goblets. If kept well, this wine has an average conservation period of five to eight years. The bottles should be laid horizontally in a cool, dark, humid wine-cellar.